Hiding scars has never been easier in Aventura. Permanent makeup artist, Jolie, has been perfecting the technique for over 8 years. Having first trained in Europe, Jolie brought her skills to the United States and now, Aventura. At Permanent Cosmetic Artistry by Jolie, you’ll experience quality, professional, micro pigmentation services by a licensed esthetician. Not only that, Jolie applies her artistic skills and attention to detail to every application ensuring natural-looking permanent makeup and exceptional tattoo scar camouflage. 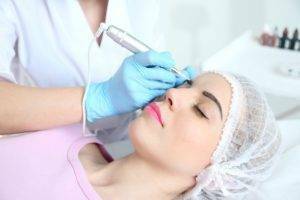 Aventura residents will enjoy a full range of cosmetic and paramedical permanent makeup services at Permanent Cosmetic Artistry. At Permanent Cosmetic Artistry by Jolie, we serve clients with varied needs. Every solution is individually tailored to your wants and needs with your satisfaction as our number one goal. Some clients come to us for permanent makeup to make one aspect of their daily lives easier. Others come to us looking for permanent eyeliners or tattoo eyebrows because they can’t see as well or hold an eyeliner pencil as well as they need to anymore to apply their makeup. Still, others come to us to help them reclaim their looks that have been ravaged by disease, accidents or surgery. Cancer patients rely on us to create permanent eyebrows for them or for areola restoration after a mastectomy. We can treat stretch marks or Viltigo with tattoo scar camouflage in Aventura. At Permanent Cosmetic Artistry, you can be assured of a safe, sterile environment with a licensed esthetician who truly cares about your situation. Jolie prides herself on providing natural-looking permanent makeup solutions for all of her clients. We will consult with you to determine exactly what you want before we begin any procedure. We see clients from all walks of life and at all ages. Meet us and let us help you regain confidence in your appearance. Contact us at 1-855-565-2682 to learn more about our services or set up a consultation.